That's right everyone! You have been waiting for them and I am pleased to say that they are finally here! I present you JADE's RPG Character Dice Set II. They are fully compatible with D&D 5, containing all races and classes featured in Dungeons and Dragons' latest edition. I am sure you all have many question so let me try to address some. 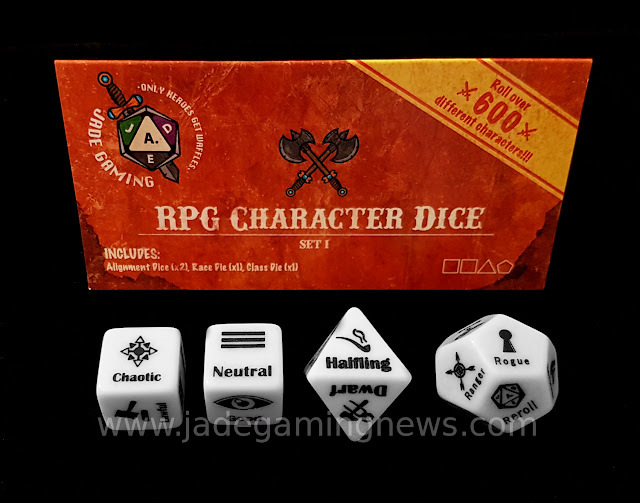 You can get a set of your own RPG Character Dice Set II from The JADE Store. They currently cost $18.25 + S&H. All prices are in $CAD (Canadian) and we ship world wide! 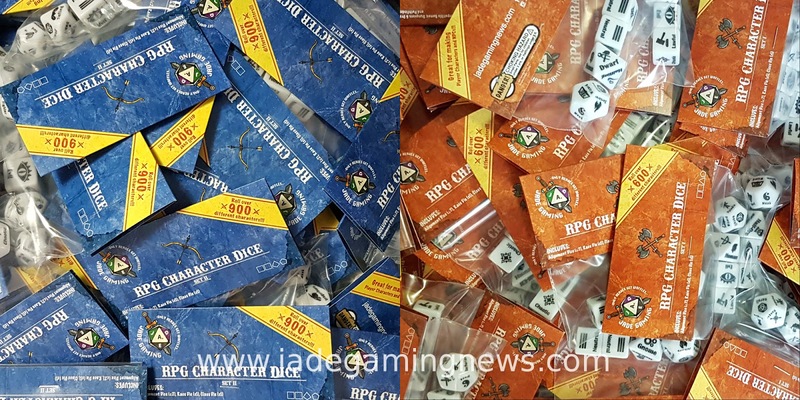 If you are interested in ordering 12 or more sets give email us at jadegamingnews@gmail.com and we can discuss our retailer discount pricing. What makes Set II different from Set I? Set I is compatible with D&D 3, 3.5 and Pathfinder. and contains the races found in those respective rule books. Now aside from Set II being compatible with D&D 5, they are are also Larger. Set I are 18mm Scale Dice, and Set II are 21mm Scale Dice. Are you still selling Set I? Absolutely! You can also find them in The JADE Store. And they even have an ever so slightly updated label. 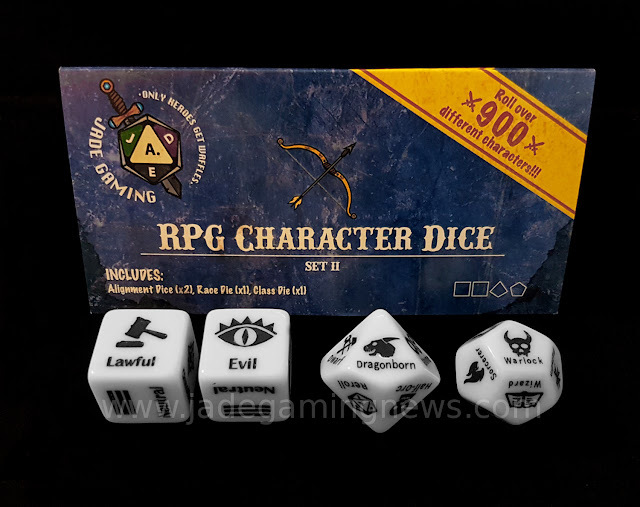 It now says Set I under the RPG Character Dice... Fancy. Why did it take you guys so long? Making these dice has been way more of a challenge then we ever thought it would be! We've seen issues with manufacturers producing the wrong of size of die, not being able to reproduce our images properly, issues getting packaging supplies, and on top of this we all have day jobs. So thanks for waiting! We got them out as fast as we could! What's New in the JADE Store? This time around we have our RPG Character Dice Set I, and Set II We all so have Jumbo Set I RPG Character Race Dice. Some of you may have seen these handed out as promos; now they are for sale. We also have Set I and Set II Factory rejects for those who don't mind a blemish or a missing face or two on their die for a severally reduced price. That's it! If you have any other questions please comment below and we will get back to you right away! Don't forget to snag a set of your own from The JADE Store, And as always... Happy gaming! Hi There I am sorry to hear that! There was a postal strike in Canada that delayed a few of our orders. Send me an email at jadegamingnews@gmail.com along with your order number and I will get your dice to you!